A group of astronauts await tests of the Lunar Roving Vehicle test unit. 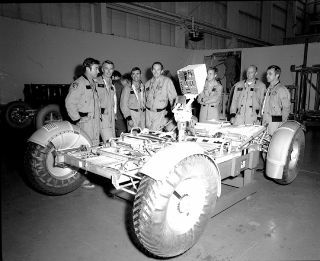 In this historical photo from the U.S. space agency, in November 1971, (from left to right) Astronauts John Young, Eugene Cernan, Charles Duke, Fred Haise, Anthony England, Charles Fullerton, and Donald Peterson await deployment tests of the Lunar Roving Vehicle (LRV) qualification test unit in Building 4649 at the Marshall Space Flight Center (MSFC). The LRV moon rover, developed under the direction of the MSFC, was designed to allow Apollo astronauts a greater range of mobility on the lunar surface during last three lunar exploration missions: Apollo 15 , Apollo 16 and Apollo 17 .